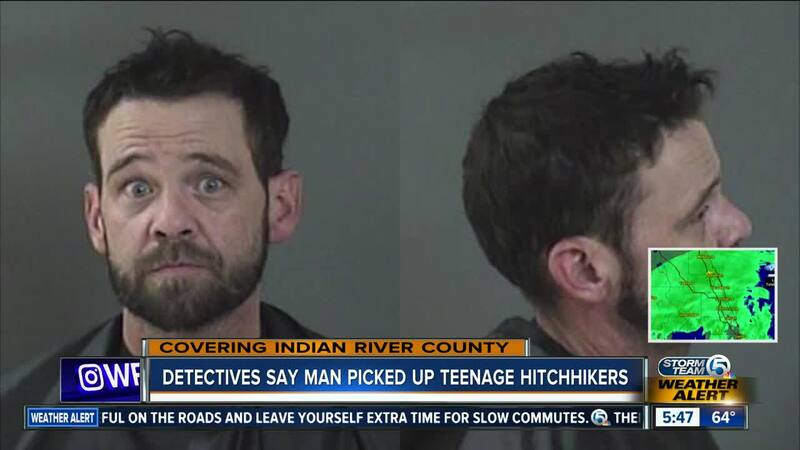 A Florida man is accused of picking up four teenage hitchhikers and giving them alcohol in Indian River County. INDIAN RIVER COUNTY, Fla. — A South Florida man faces multiple charges after the Indian River County Sheriff's Office said he picked up four teenage hitchhikers and gave them alcohol early Sunday morning. According to the arrest report, a deputy spotted a Dodge pickup truck speeding and swerving around 1:35 a.m. in the 3700 block of US 1. After the truck was eventually pulled over, the deputy said he spotted four juveniles, three who are 15 years old and a 13 year old, in the front and back seats. The deputy questioned the teens, and they all said they did not know the driver, identified as Christopher Morin, 39, of Marathon, Florida, and stated he was giving them a ride. The teens said they were walking home from the fair when Morin pulled up and offered them a ride. All four teens told the deputy that Morin offered them drinks from a cooler in the back of his truck, which included vodka. Cannabis residue, which tested positive for THC, and a "one-hitter" pipe was also found inside the truck, according to the sheriff's office report. A large, fixed-blade knife in a sheath was discovered concealed between the front-driver and passenger seats. The sheriff's office said Morin did not have a valid concealed weapons permit. Morin said he uses the knife for fishing, but no other fishing equipment was found in his truck. The 39-year-old man said he did not know the ages of teens. All four of the teens were later turned over to the custody of their parents. The report said none of the parents knew Morin or gave him permission to give the children a ride. Morin was arrested and faces multiple charges including felony fleeing and eluding along with four misdemeanor counts of contributing to the delinquency of a minor, one misdemeanor charge of carrying a concealed weapon and one misdemeanor charge of drug paraphernalia possession.